from it then came a diamond Geezer. The nature of the Diamond Geezer was irrepressible! 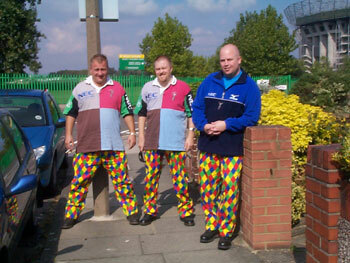 Other sources suggest that Quins fans, fed up with the reputation of being snobbish, unfriendly and never being seen without either Barbour or blazer and tie, decided to go back to the origins of the Harlequin (or Arlechino) from the Italian Commedia dell'Arte and thus the Diamond Geezer was formed. It is supposed to have happened at a "brain storming session" (East Stand Bar at about 10.00pm one Saturday night in early 2001) when Mr Copsey was bemoaning (dribbling) that everyone thought that Quins fans were stuck up bunch of blazer wearers when actually they are "a well regular bunch of geezers". A few sentences (pints) later he said "and anuver fing why is the club emblem wearin' diamonds and the team play in squares?" at this point he slid to the floor to ponder this conundrum in private. Moments later the bar was silenced, the crowd parted and a light from high fixed Mr Copsey, he rose to his feet , eyes agog, hands held high and with a smile was heard to say "they're Diamond Geezers". Genius is a word rarely used for Mr Copsey (can't think why) but on that night he had surpassed himself, a job well done, Mr Copsey returned to his position of deep thought to ponder the problems of world famine, little children without playstations and how did Rupert Moon managed to get recalled and play for Wales again?! CarpetBagger, The Druid and BaldRick were next. 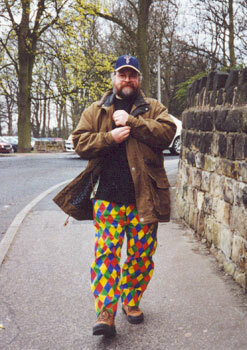 The Geezers were first seen by the public at large in a TV broadcast of the Bridgend vs Harlequins game when geezer trousers were worn with panache by Howard. More recently Geezers and Geezering activities have been reported in the press, on TV and radio.